In a report released today, the U.S. Energy Information Agency (EIA) predicts that expanded shale production in Texas’ Permian Basin and new discoveries in the Gulf of Mexico will push U.S. crude oil production to unprecedented levels next year. 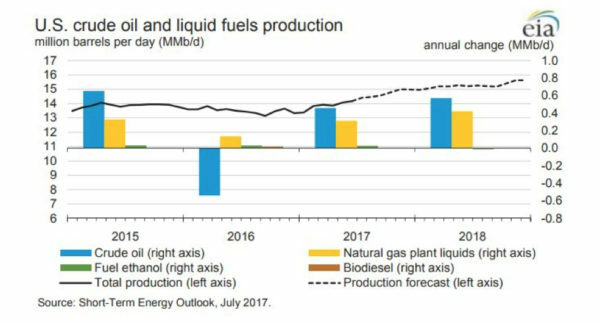 The EIA’s July Short Term Energy Outlook (STEO) forecasts average production of 9.3 million barrels per day (b/d) in 2017, up 0.5 million b/d from 2016. By 2018 that number rises to 9.9 million b/d, surpassing the previous record of 9.6 million b/d set in 1970. The agency also predicts that even in a low commodity price environment, production of tight and non-tight oil from prolific formations in the Texan Permian will continue to rise with lower costs, greater efficiency and new technology. These shale formations are particularly potent since, with the help of hydraulic fracturing, drillers can access multiple oil rich layers of shale with the same drilling rig, producing more oil from few above-ground rigs. This increased production could not come at a better time since the U.S. lifted its longstanding and misguided ban on crude oil exports last year. Coupled with new production, the end of the ban means an even healthier industry, cheaper gasoline at the pump, and more American jobs. 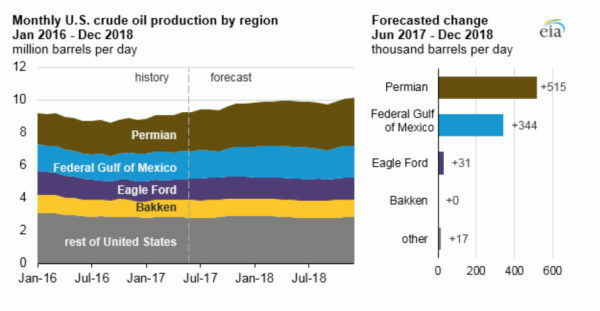 The Permian, which covers 53 million acres from Western Texas to Southeastern New Mexico, is expected to produce 2.9 million b/d of crude oil by the end of 2018, nearly 30 percent of total U.S. crude oil production. All this adds up to a predicted increase from 366 rigs to 370 in the region by 2018 despite relatively flat crude oil prices since December 2016. The STEO singled out the Midland and Delaware Basins in particular as extremely promising areas of future growth, with prolific formations like Wolfcamp, Spraberry and Bone Spring. The future for the Gulf of Mexico is also bright with drilling restrictions being eased and longer time frames for offshore rig construction means their capital investment is less impacted by lower prices. In 2016, eight projects came online in the Gulf, contributing to production growth. Another seven projects are anticipated to come online by the end of 2018. This is coupled with huge new investment in the past few years and $240 billion worth of major industrial projects announced or completed along the Gulf Coast thanks to low fuel prices. 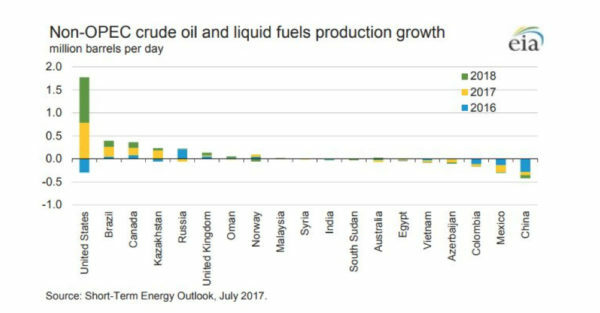 Based on anticipated production at both new and existing fields, crude oil production in the Gulf is expected to increase to an average of 1.7 million b/d in 2017 and 1.9 million b/d in 2018. The EIA forecast paints a decidedly less optimistic picture of the rest of the globe, however, with very little new non-OPEC production in the next two years. OPEC’s outlook also remains pessimistic with rogue member nations exceeding production caps set by the energy cartel, instability in many of its member states, and continuing cost pressure from U.S. producers. Meanwhile, American producers will find themselves in an increasingly dominant global energy position and that’s good news for U.S. consumers, businesses, and the economy as a whole.